Testing the user interface of a web application is an important part of the development lifecycle. 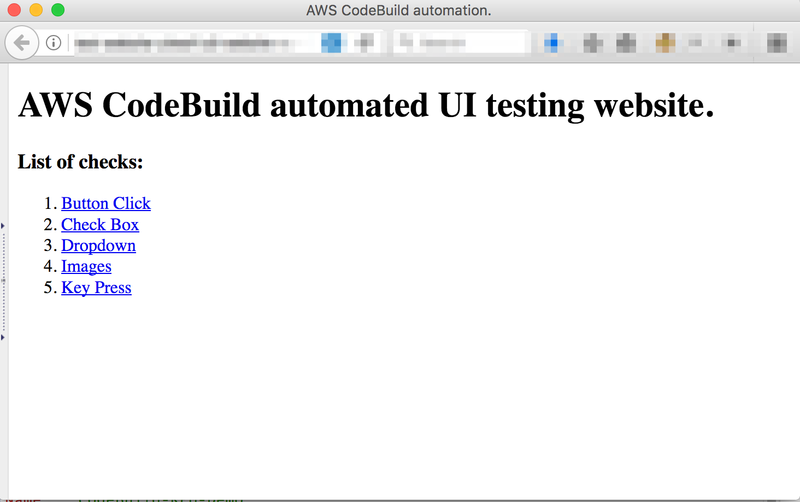 In this post, I’ll explain how to automate UI testing using serverless technologies, including AWS CodePipeline, AWS CodeBuild, and AWS Lambda. I built a website for UI testing that is hosted in S3. I used Selenium to perform cross-browser UI testing on Chrome, Firefox, and PhantomJS, a headless WebKit browser with Ghost Driver, an implementation of the WebDriver Wire Protocol. I used Python to create test cases for ChromeDriver, FirefoxDriver, or PhatomJSDriver based the browser against which the test is being executed. Resources referred to in this post, including the AWS CloudFormation template, test and status websites hosted in S3, AWS CodeBuild build specification files, AWS Lambda function, and the Python script that performs the test are available in the serverless-automated-ui-testing GitHub repository. AWS CodeBuild supports custom containers so we can use the Selenium/standalone-Firefox and Selenium/standalone-Chrome containers, which include prebuild Firefox and Chrome browsers, respectively. Xvfb performs the graphical operation in virtual memory without any display hardware. It will be installed in the CodeBuild containers during the install phase. The environment variables section contains a set of default variables that are overridden while creating the build project or triggering the build. As part of install phase, required packages like Xvfb and Selenium are installed using yum. During the pre_build phase, the test bed is prepared for test execution. During the build phase, the appropriate DISPLAY is set and the tests are executed. - echo "Executing simple test..."
Because Ghost Driver runs headless, it can be executed on AWS Lambda. In keeping with a fire-and-forget model, I used CodeBuild to create the PhantomJS Lambda function and trigger the test invocations on Lambda in parallel. This is powerful because many tests can be executed in parallel on Lambda. The build specification for PhantomJS testing also includes multiple phases. It is a little different from the preceding example because we are using AWS Lambda for the test execution. As part of install phase, the required packages like Selenium and the AWS CLI are installed using yum. During the build phase, a zip file that will be used to create the PhantomJS Lambda function is created and tests are executed on the Lambda function. - echo "Packaging Lambda Function..."
- echo "Creating Lambda Function..."
echo "Lambda function already exists." The list of test cases and the test modules that belong to each case are stored in an Amazon DynamoDB table. Based on the list of modules passed as an argument to the CodeBuild project, CodeBuild gets the test cases from that table and executes them. The test execution status and results are stored in another Amazon DynamoDB table. It will read the test status from the status table in DynamoDB and display it. 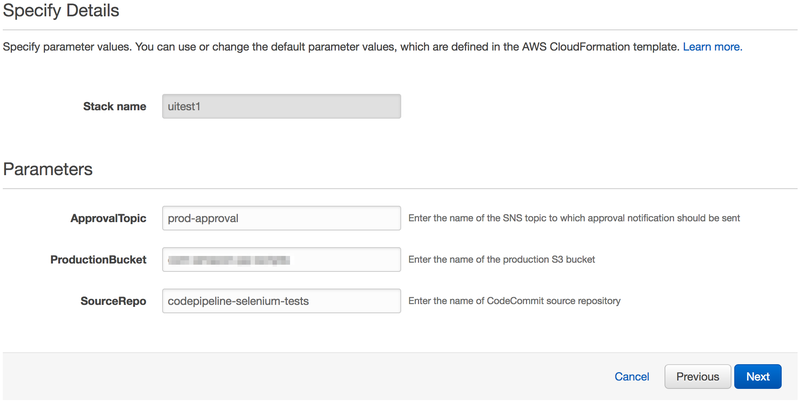 AWS CodeBuild and AWS Lambda perform the test execution as individual tasks. AWS CodePipeline plays an important role here by enabling continuous delivery and parallel execution of tests for optimized testing. Pipeline stages, the actions in each stage, and transitions between stages are shown in the following diagram. CodePipeline automatically detects a change in the source repository and triggers the execution of the pipeline. 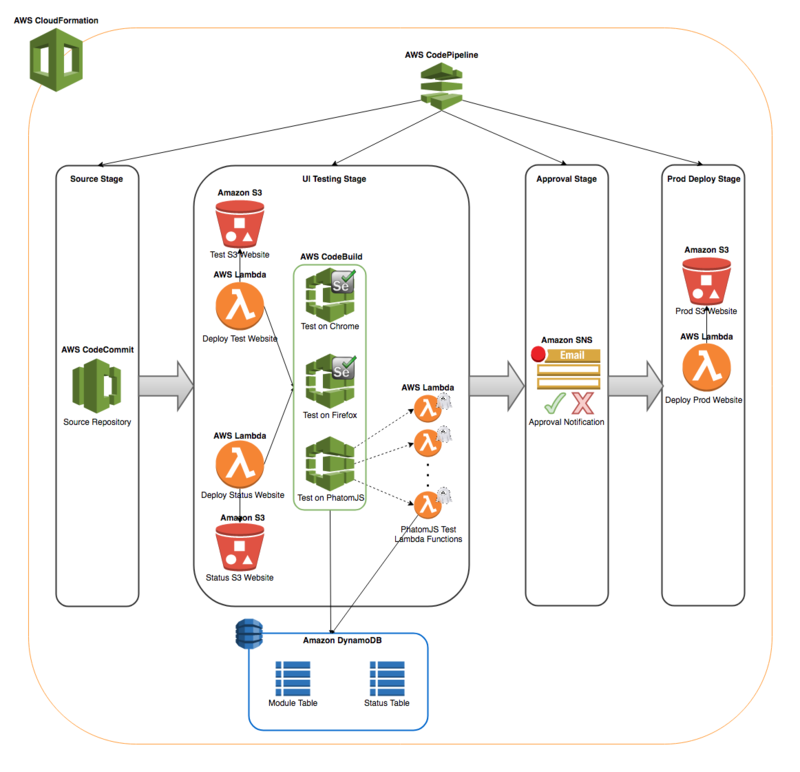 DeployTestWebsite invokes a Lambda function to deploy the test website in S3 as an S3 website. DeployStatusPage invokes another Lambda function to deploy in parallel the status website in S3 as an S3 website. 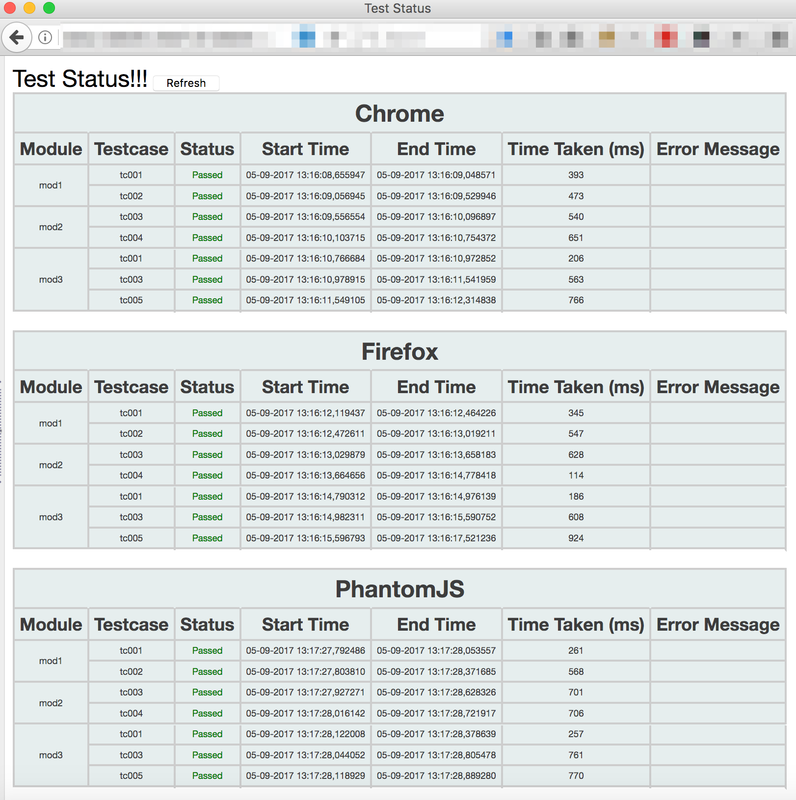 TestOnChrome launches a container to perform the Selenium tests on Chrome. TestOnFirefox launches another container to perform the Selenium tests on Firefox. TestOnPhantomJS creates a Lambda function and invokes individual Lambda functions per test case to execute the test cases in parallel. When the UI testing is completed successfully, the pipeline continues to an Approval stage in which a notification is sent to the configured SNS topic. The designated team member reviews the test status and approves or rejects the deployment. Upon approval, the pipeline continues to the Production stage, where it invokes a Lambda function and deploys the website to a production S3 bucket. I used a CloudFormation template to set up my continuous delivery pipeline. The automated-ui-testing.yaml template, available from GitHub, sets up a full-featured pipeline. SNS topic to send approval notification. S3 bucket name where the artifacts will be stored. The stack name should follow the rules for S3 bucket naming because it will be part of the S3 bucket name. 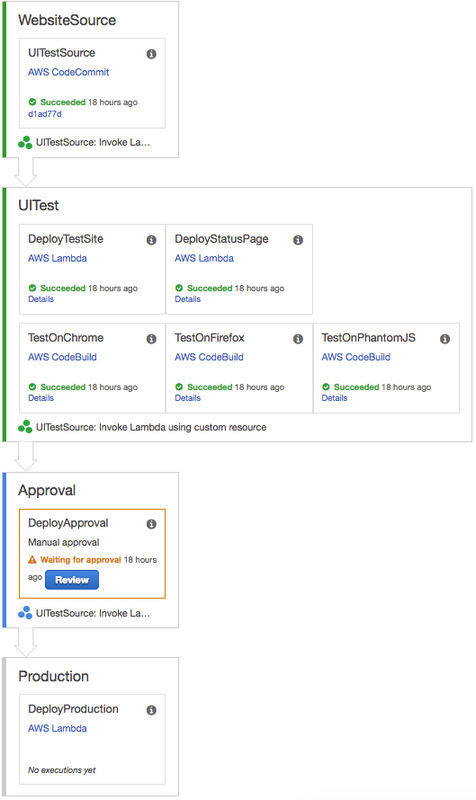 In this post, I showed how you can use AWS CodePipeline, AWS CodeBuild, AWS Lambda, and a manual approval process to create a continuous delivery pipeline for serverless automated UI testing. Websites running on Amazon EC2 instances or AWS Elastic Beanstalk can also be tested using similar approach. 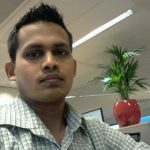 Prakash Palanisamy is a Solutions Architect for Amazon Web Services. When he is not working on Serverless, DevOps or Alexa, he will be solving problems in Project Euler. He also enjoys watching educational documentaries.